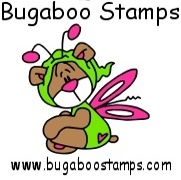 Well, it's New Release Day at Bugaboo Stamps! This is one of Jodie's new images, Christmas Doodles. It actually comes with two ornaments, a snowflake, 25 and a star! I have separated and individually used three of them. Be sure to stop by and see the rest of the New Releases. Also stop by Catch the Bug to get more inspiration from the DT.